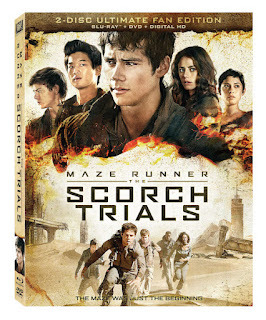 MAZE RUNNER: THE SCORCH TRIALS, is available now on Digital HD, Blu-ray™ and DVD. It's very rare that I watch movies out of turn but that was the case with Maze Runner: The Scorch Trials. I still haven't seen the first one, but that will soon change. I also admit I haven't read the books. But that will soon change too. Now that I've watched this sequel, I'm interested to know more about the whole storyline from beginning to end. Soon it's learned that the camp is using the teens to harvest a certain brain enzyme that is a cure for a zombie-type outbreak. The teens aren't too keen on this idea and make a break for it. Only the outside isn't much better than where they were to begin with. They have to face harsh weather conditions, broken down buildings, and rabid half-dead humans. They are on a mission to find the Right Arm Movement, which they hope will help protect them. They get caught up with other people along the way, some who end up being traitors and some who unexpectedly help them. There's a lot of mention of "The Maze" that they had to endure before this harrowing pursuit. And because of that I now want to know what The Maze was all about. Although this movie is geared towards teens, I found it to be captivating. There were a couple of lulls that didn't need to drag out but it was fast-paced for the most part. There are a couple scenes that younger teenagers might not need to be exposed to, including an alcohol induced party with scantily clad girls. The ending definitely suggested there will be a third Maze Runner movie to be released and I'm definitely itching to watch it. I love Mazerunner! It's my favorite of all the teen apocalyptic movies. Just good fun. Also, I loved they used Motorcycle's As The Rush Comes in the soundtrack. One of my favorite trip hop/chill out songs!! My boyfriend and I saw the first Maze Runner in theaters when it was out and thought it was very good so naturally when the second hit theaters we headed to see that one as well. I think the second was definitely on par with the first!